Has anyone made a cutting table with shelves underneath? Thread: Has anyone made a cutting table with shelves underneath? I want to make one myself but can't find a plan that doesn't have space underneath for a chair. I don't plan to sit at this table and want as much storage as possible underneath it. I think I can figure out a plan myself but before I go to that trouble, I was wondering if anyone else has made anything like this. My current top, which I plan to reuse, is about 3 x 5 so the bottom part will probably be about 2 x 4 or at most 2.5 x 4.5 feet to leave overhang space for clips. I want the bottom part to have shelves that I can put baskets or those fabric bins that HD sells in it. I'm not good enough (yet) to make something with drawers. How about just getting some bookcase units from Target, Office Depot, Ikea, or somplace like that and arrange them so they face out in the size you want. You could keep the top from sliding with little rubber feet, glue, caulk, or epoxy. Closet Maid (at Target and Lowe's) has those units that take square cloth bins where you could hide some of your goodies. They often go on sale, too. I'm avoiding particle board. I don't have an Ikea and I think all of the other places here have the particle board shelves. But I can make shelves and put them together-but since I'm planning to make the whole thing I can do it the exact sizes I want. I can use wood or mdf which is not as stinky or chip-py as particle board. I was just hoping for tips or pictures of ones people have made themselves with or without store bought shelves, but without the space underneath for a chair. Last edited by amyjo; 06-28-2013 at 12:58 PM. My husband made me one, its the same size as a sheet of plywood, has 2 layers of shelves underneath. He even made a well for my sewng machine. Its large enough to hold 2 of the large cutting mats. He rounded the corners off, sanded and stained it. And its on large casters. I just love it, so much room on those shelves! 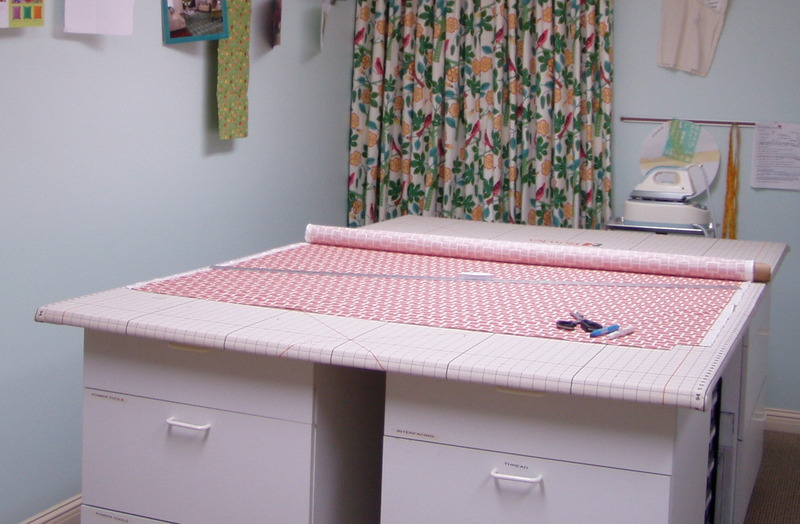 Good idea to include space for sewing machines. I have 2 other than the one I use all the time so I should make room for those under the cutting table. I used base kitchen cabinets underneath mine. It's a very heavy duty base with sturdy drawers all around. Some are deeper than others and there is some open shelving as well. Personally I think Nouveau's with the cabinets underneath is the way to go. Any space under a table is "dead space" unless the shelves are individually designed with particular items in mind. Why waste that space when most of us are cramped enough as it is? My sewing table does have a shelf underneath but it merely stores a couple of plastic bins of future projects. I might design it differently today, but can't afford to have another one built' this one is fine. You might go to a second hand store or an antique store and buy an old dresser to use as a base. I use the top of my ironing board as a cutting table as I like to stand and cut. I have the wooden top that fits over the ironing boards. My cutting mat fits on it nicely. Look in organisation there are many ideas on doing this. I would say just remember toe room. Ikea seems to be the most popular starting place I have been thinking about kitchen units but not sure they are cheaper than units, I was thinking about being able to adjust the height with those plastic things under the unit. thanks everyone. What I am looking for are ideas or plans where I can make it from scratch with wood from the lumberyard. I don't have any decent thrift shops and any that do have furniture they are either grossly overpriced or really bad condition furniture. I have been looking for pieces now for over a year (not just for this but for other areas of my house) and the people here are extremely proud of their stuff. We went to a secondhand shop a couple of weekends ago and none of the desks/hutches they had were under $800. Plus not a single one would have worked for my space. That is why I'm wanting to make something. I'll look in the other areas of this forum. I'm not worried about toe room since my plan is for the underneath part to be at least 4-6" smaller than the top-so that I can clip quilts on while basting. So that should automatically give it plenty of toe room. The nearest ikea is hours away so that is not an option and I don't care about it being adjustable. I just want it on casters so I can move it around. I use the top of my ironing board as a cutting table as I like to stand and cut. I have the wooden top that fits over the ironing boards. My cutting mat fits on it nicely. Actually that is another project I'm doing. 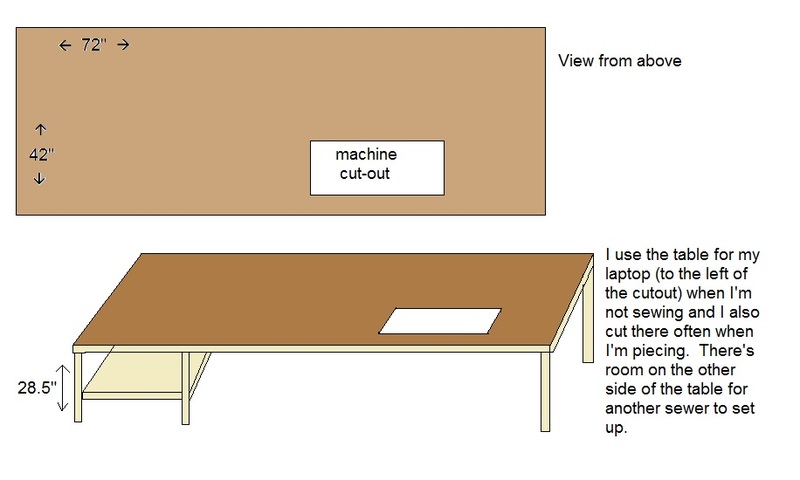 I'm going to use one of our current kitchen cabinets, which is about 5' x 2', for an ironing table. Then I'll have the doors and drawers of it for storage. We're having a whole new house built and our old house will be demolished so I'm using a lot of what's here that will be salvageable. Unfortunately the cabinets are too tall to be a cutting table because of wanting to have them on wheels and the fact that I'm pretty short. Other than our upper peninsula cabinets, which are way too long, all of our upper cabinets have angled ends so those won't work for it either. I know I'm spoiled but I really want a separate cutting and ironing area. Ikea delivers i bought a table there and love it. Pretty cheap compared to have to buy wood. The top is smooth. For my zip code, the minimum heavy item delivery charge is $349. That is only for the delivery. The order itself has to be at least $200 so that's a minimum $549. I can't afford that. We have some wood here from other projects so I wouldn't have to buy all of it new. I had one made from a kitchen cabinet by my friend. He built a bookcase at the other end. I love having the storage space and having a place to sit to work on applique, that's for sure! Oh wow, that is really nice!! I might look at some of the unfinished cheap cabinets at HD but I think for me, a standard height cabinet will be too tall once I put it on wheels (which probably add 3" or so) and put the top surface on. Plus, if it's on casters it will have to have a solid wood surface between the casters and the cabinets in order to be sturdy enough. So that would add another 3/4" or so. Here's mine. It's 3 prefab cabinets set side by side. The top is melamine 24" wide shelving, 76" long that sits on the top. Both cabinets and shelving are from Home Depot. The top is covered with 24" x 70" olfa cutting mat. I had a wider cabinet but couldn't reach all the way across. This one I can walk around and cut from 3 sides. It sits perpendicular to the closet at the center, so I can still get into the closet from either side. Nouveau stitch, I love your cutting table! My husband made mine out of a old dresser. 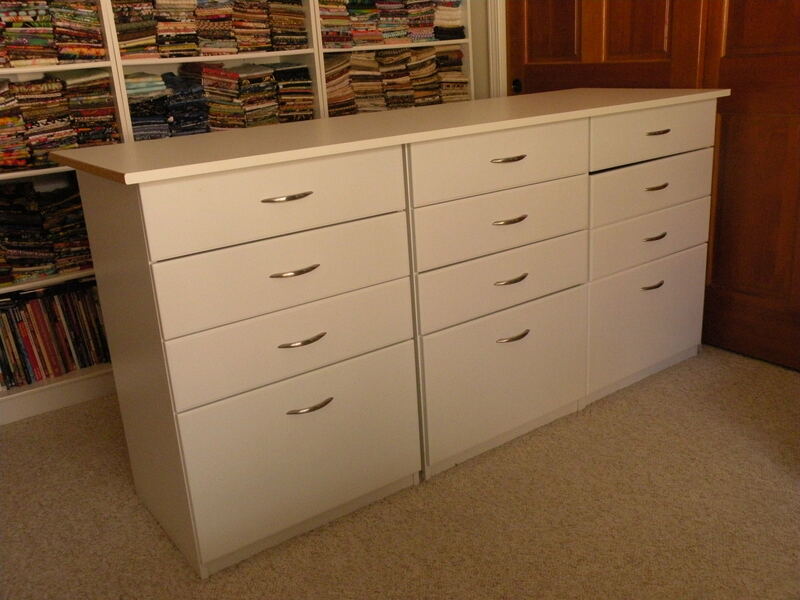 It was one of the long dressers with the 6 drawers in it. He just built a top for the size I wanted and set it on top. It has worked great. My cutting table is made out of an old three drawer dresser with an oversized top on it cut out of plywood and covered with self adhesive floor tile. There is a shelf just under the board with trays of small items (stapler, pliers, and other small stuff) and I also keep rolls of freezer paper and wonder-under type products there. The three drawers hold fat quarters, fabric that is between a fat quarter and a yard, and UFO's in the bottom drawer. Works great for me.